Thinking of starting your own newsletter? Discover a few goodies from this list of premium templates. 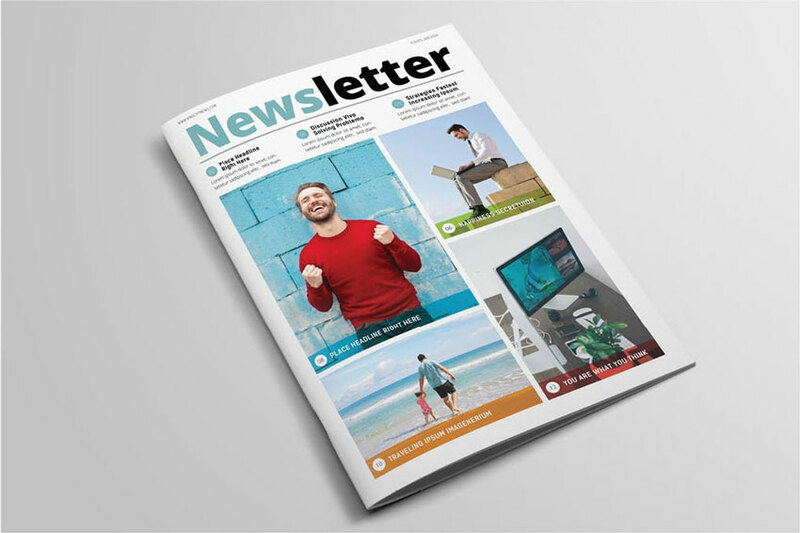 Newsletters are one of the best ways to get your readers to take notice! And high-quality, professional newsletter templates are finally here to make the process much easier! Get started with a monthly newsletter today! 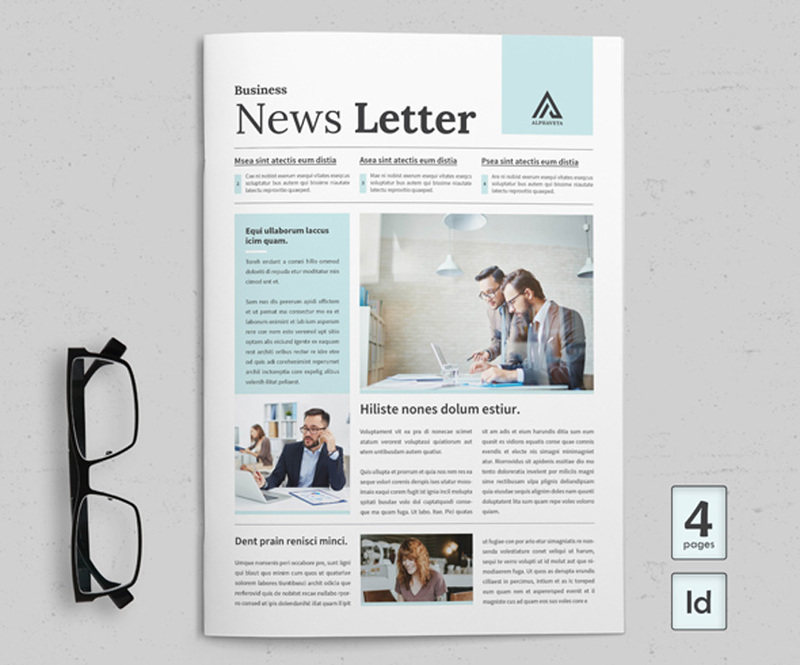 To help you begin, we’re bringing you another amazing selection of incredible InDesign newsletter templates from Envato Elements and Envato Market. 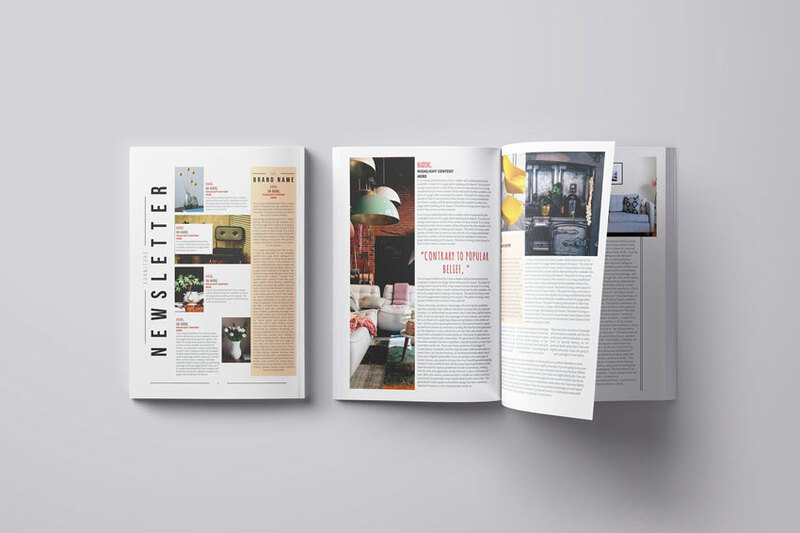 Whether you need a newsletter for your business, employees or student activities, these templates have been exclusively designed for those familiar with Adobe InDesign. 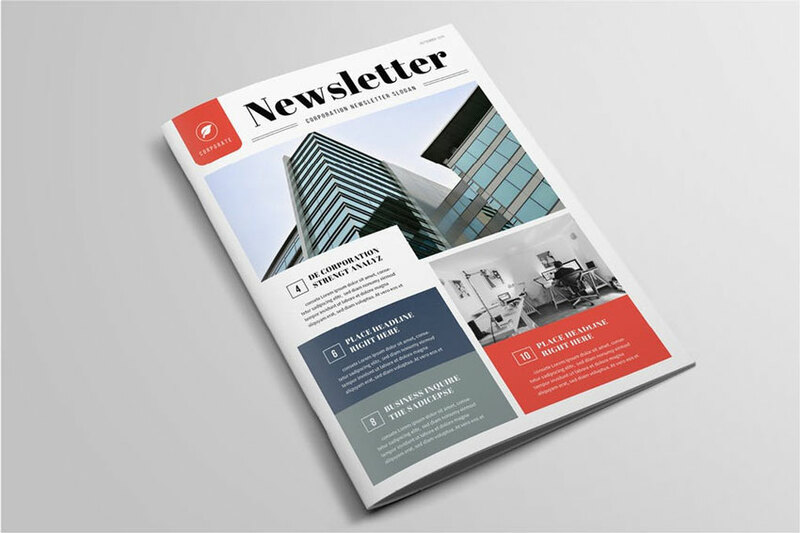 Keep your clients informed with a professional newsletter. Check out this list of favorites below. Create a winning combination to draw readers in! 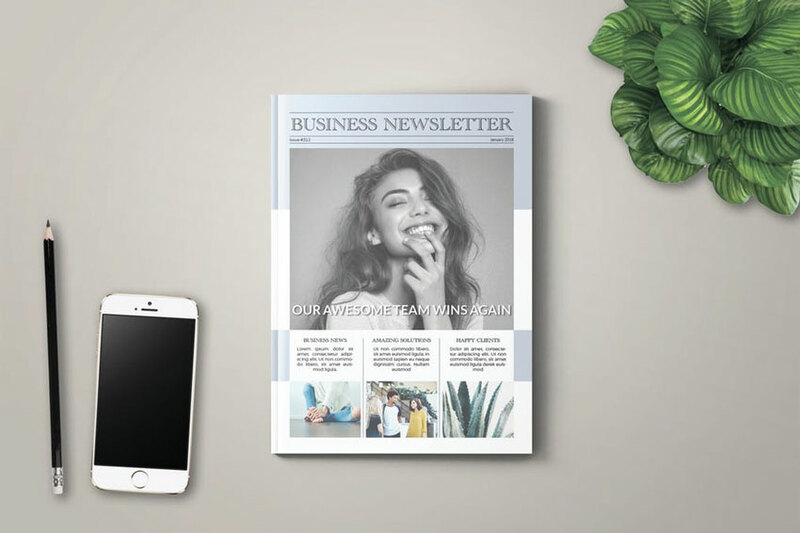 Our first business newsletter is this stylish look from GrizzlyDesign. It features a total of 10 various color combinations along with 12 uniquely created pages. Try it out for your first newsletter today! Help the world know more about important information in their local community. 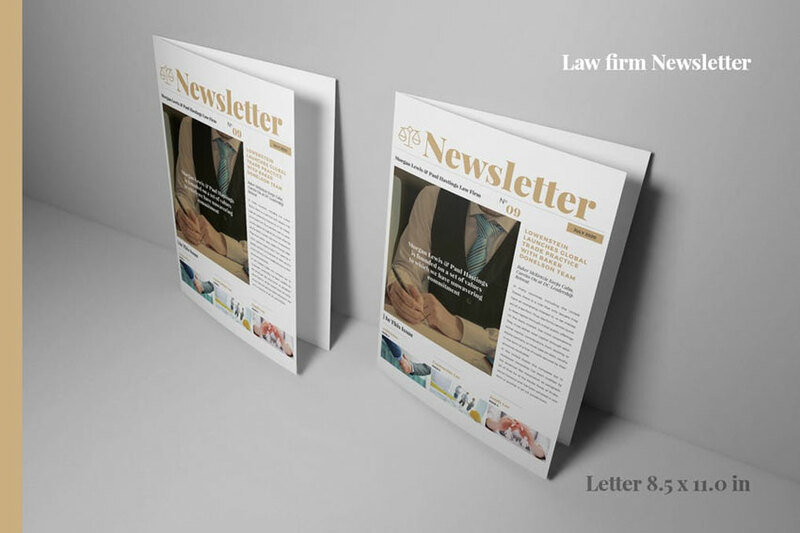 This next InDesign newsletter template is great for those who work in law and business. It features a complete branding package along with several different print layouts like bifolds, trifolds, and more. Connect to your audience by being a part of their daily routine! 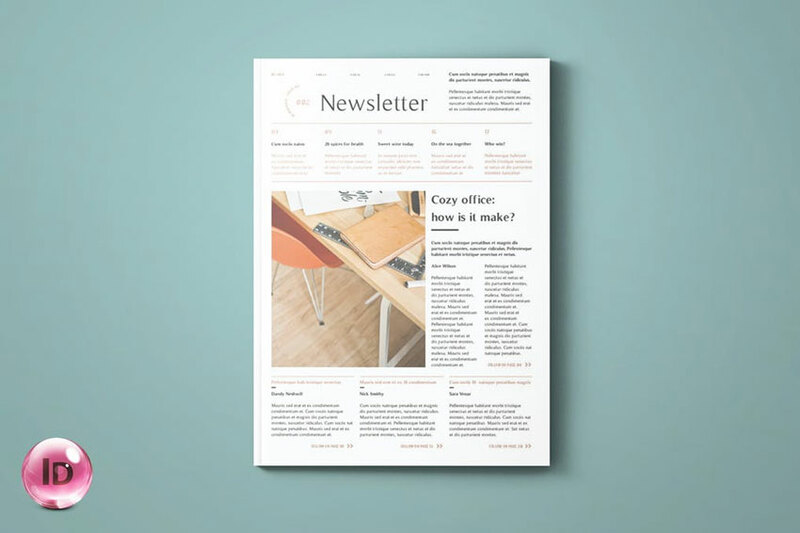 This next newsletter template is perfect for creatives and entrepreneurs. 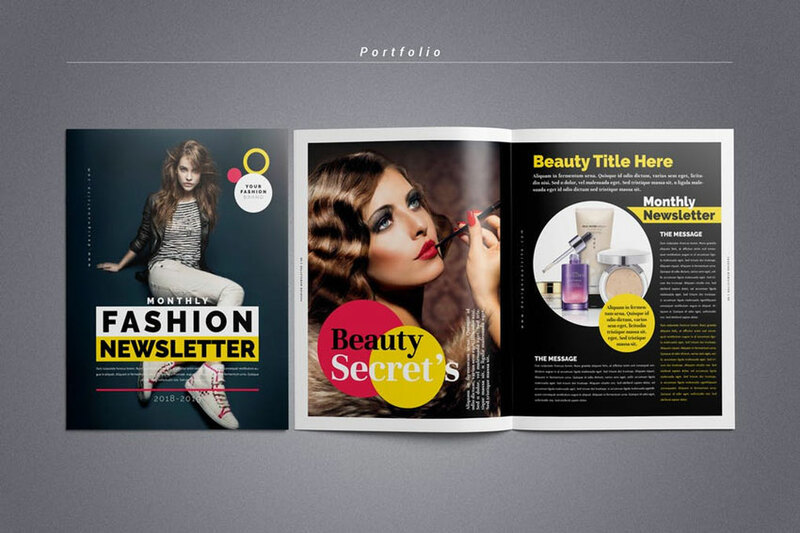 It can be used for nearly any type of industry and fits eight total pages into one stylish combination. Check it out! Not sure where to begin? 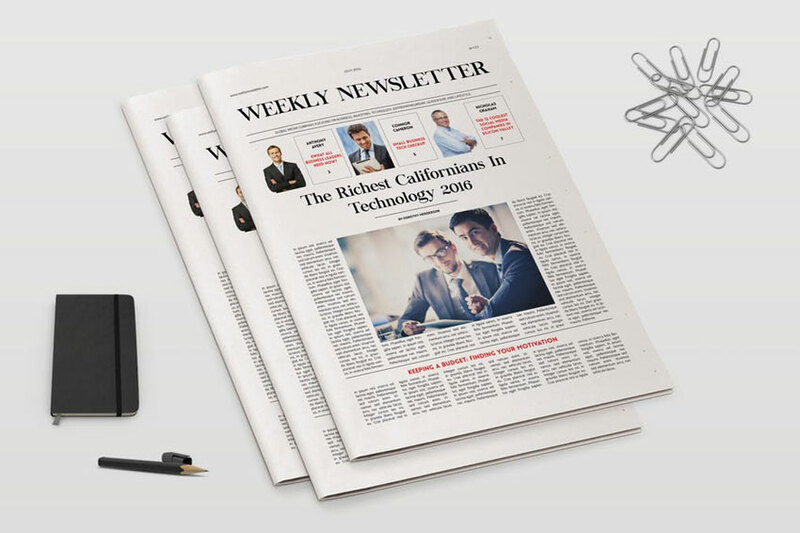 Get inspired by your local newspapers for a uniquely designed newsletter. This clean template is fully editable and saves valuable time. It’s also best suited for InDesign versions CS4 and above. Let one special color pop out on your extraordinary newsletter. 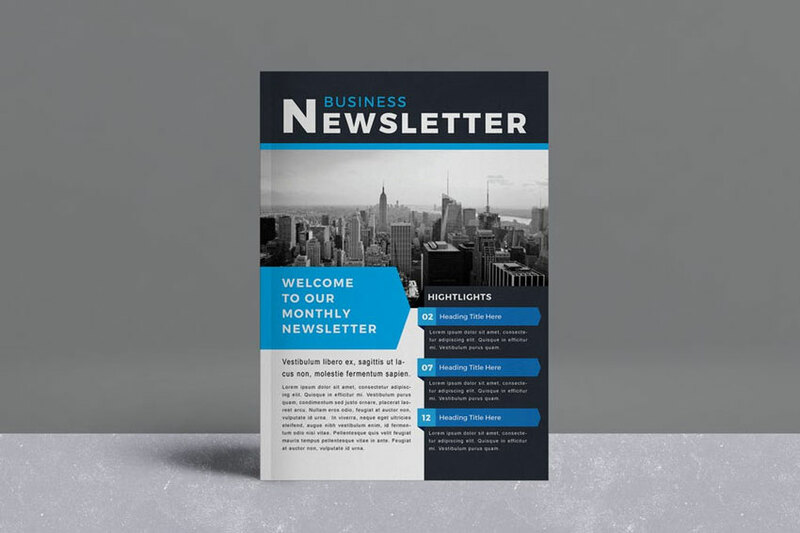 This blue newsletter template is simple and easy to use. Customize it fast with your brand or favorite colors for a bold new look. Included within this download is everything you need to get started. 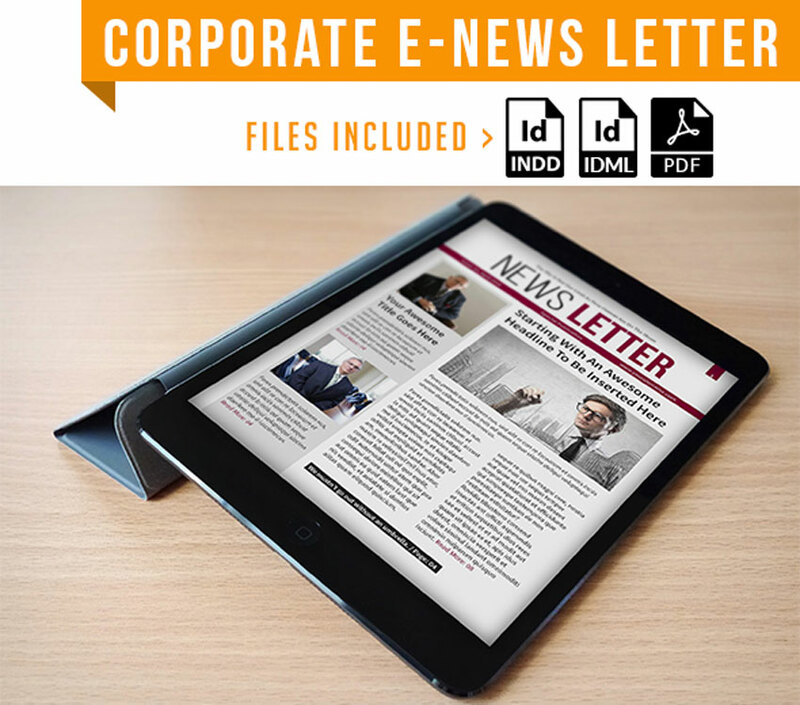 Keep your partners updated on the latest company news with this newsletter template. This design features a basic business theme with well-organized layers and so much more. Get access to free fonts and various color combinations all in one download. 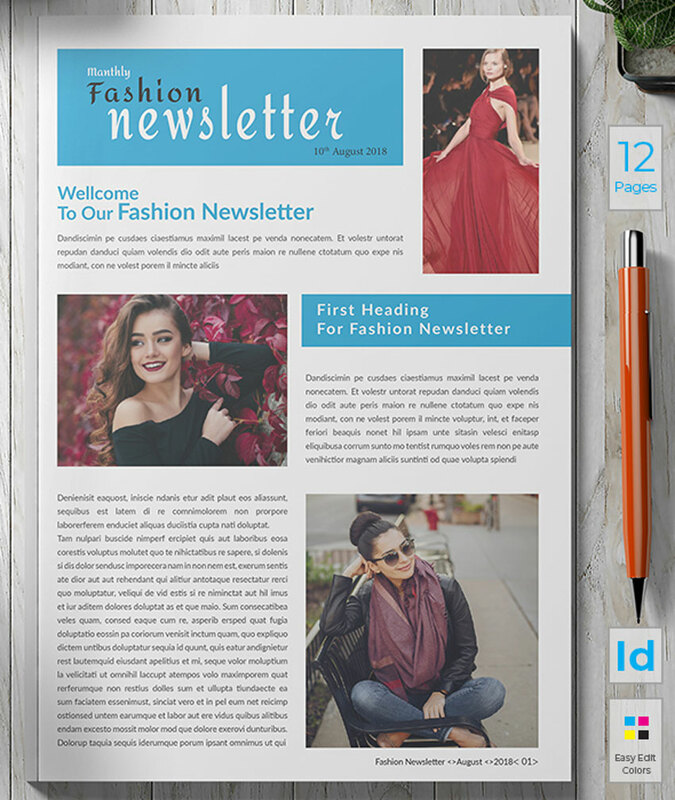 Make a fashion statement with this sharp bi-fold newsletter. Easily update the smart object placeholders with professional images of your products and inventory. You’ll also get a hold of an extra bonus pack of icons along with this download. Need a good corporate newsletter? Then check out this striking and modern design. 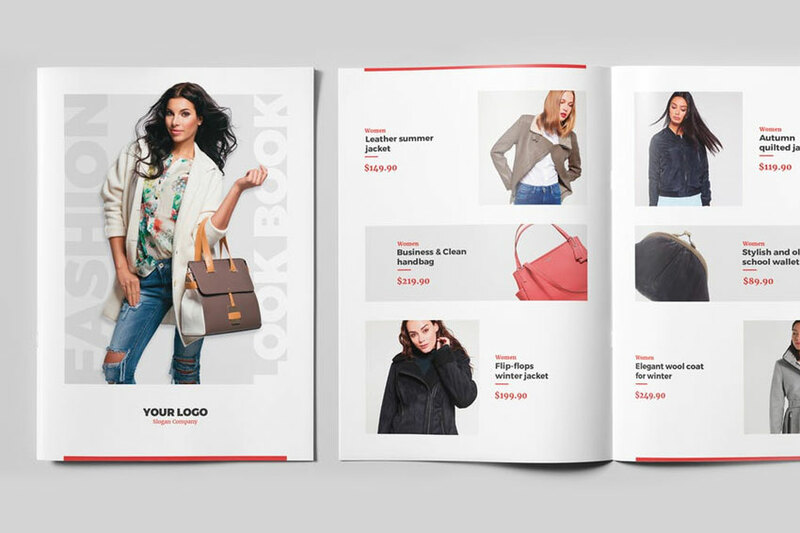 This template features an eight-paged layout with bleed guides and well-organized layers. An additional help file is also included for more instructions. Is your goal to have a career in fashion? 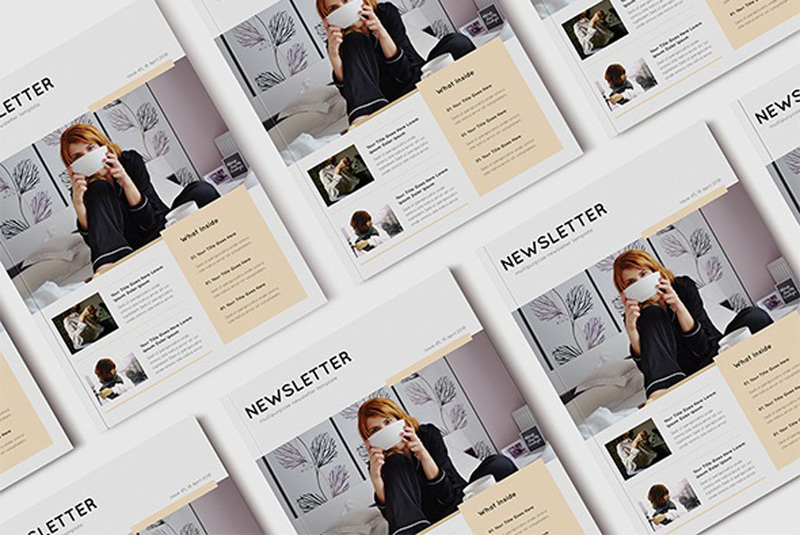 Then share your favorite tips and trends with this stylish newsletter template. Great for fashion photographers and curators, this template features 16 pages of custom layouts we know you’ll enjoy! Add it to your collection today! Highlight the latest discoveries in your industry with this next awesome template. 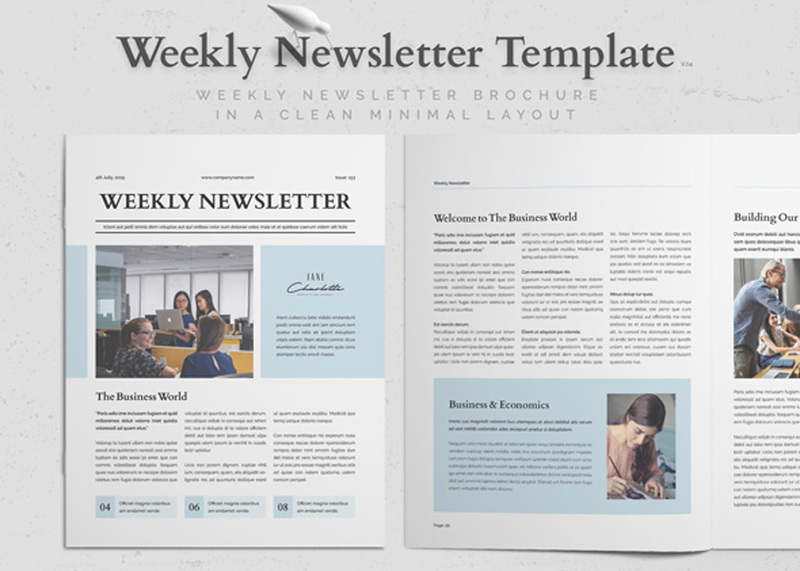 This newsletter template is simple and easy to use. Just open it up with Adobe InDesign to get started right away. Included in this download are master pages, free fonts, and more! 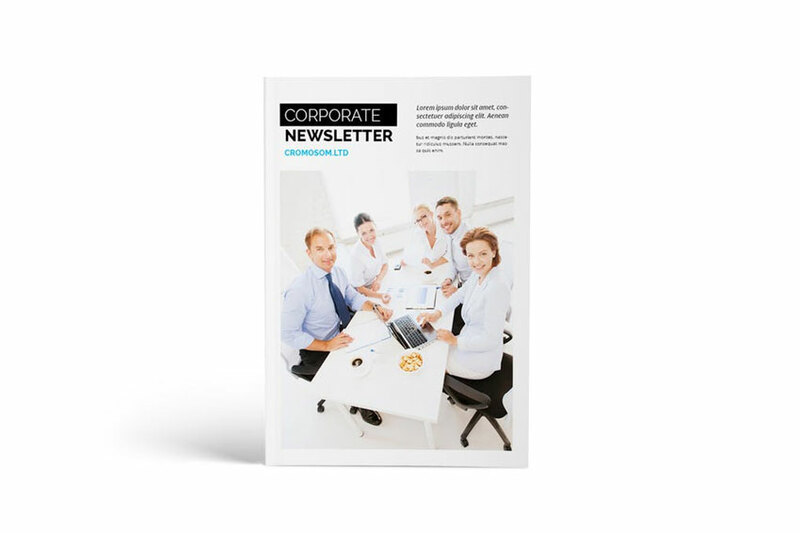 Need a corporate newsletter that is straight to the point? Perhaps this next design is right up your alley. This corporate newsletter will be a phenomenal addition to any business or organization. A minimum version of Adobe InDesign CS4 is required to edit this template. Our last business template will definitely make your company shine. 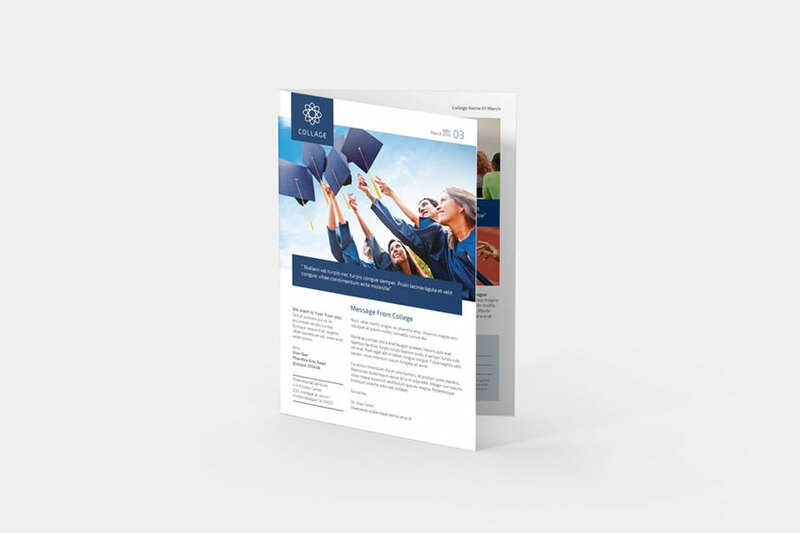 This template features a fully editable and flexible design that is ready for all your company highlights and bullet points. Get access to eight unique pages along with free fonts and more. Highlight your school activities with a monthly newsletter. Here is our next list of favorites to add to your arsenal. Show off your creativity with a striking cover. 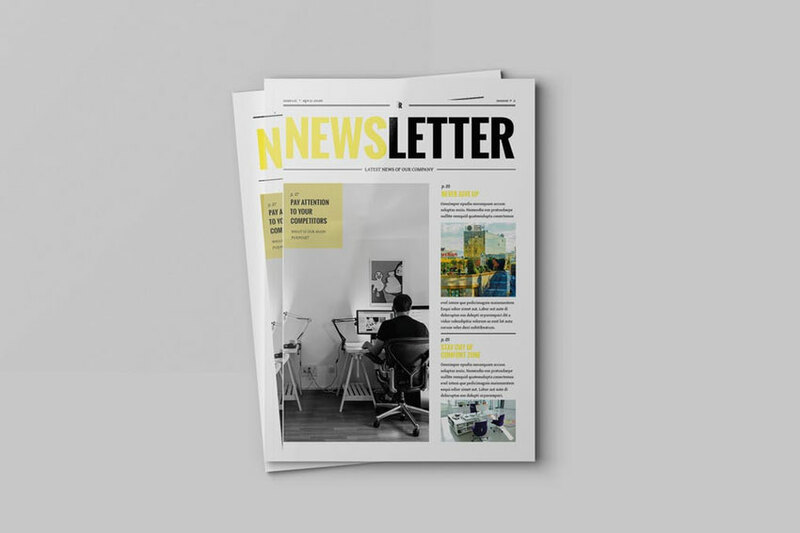 This newsletter template is great for creatives and artists. It features a soft color scheme you can easily customize to fit your school or company brand. Enjoy a clean and trendy design for under $10. Need a multipurpose template that’s great for many projects? Then check out this next awesome template. 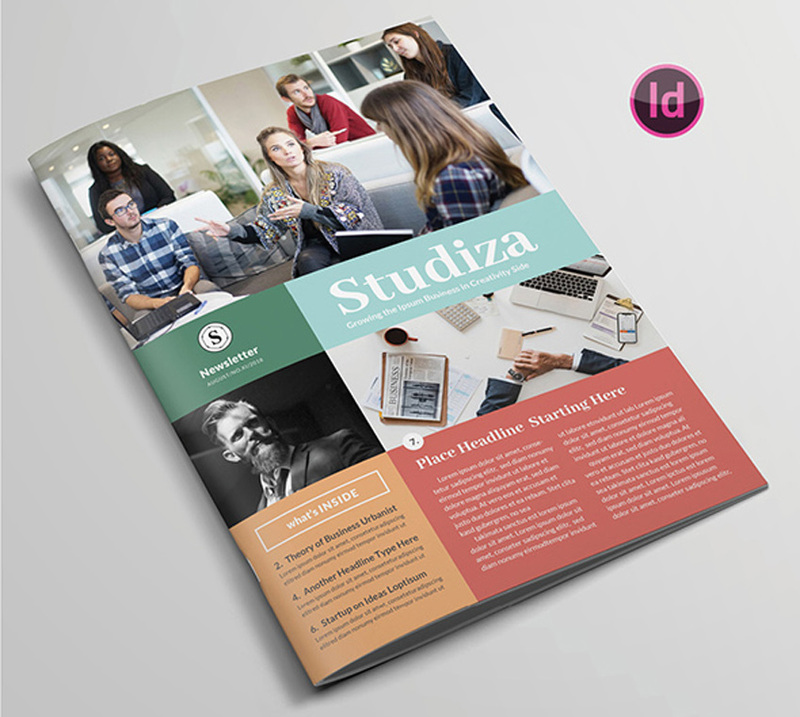 This colorful design features four InDesign files packed with all the assets you need for a custom newsletter. Mix and match the styles you like for a bold new appearance! Get to know more about your local school’s activities with this student newsletter. This professional design features a calming blue color theme with strong typography and geometric elements. Organize it to fit your needs with Adobe InDesign. What stories will you tell? 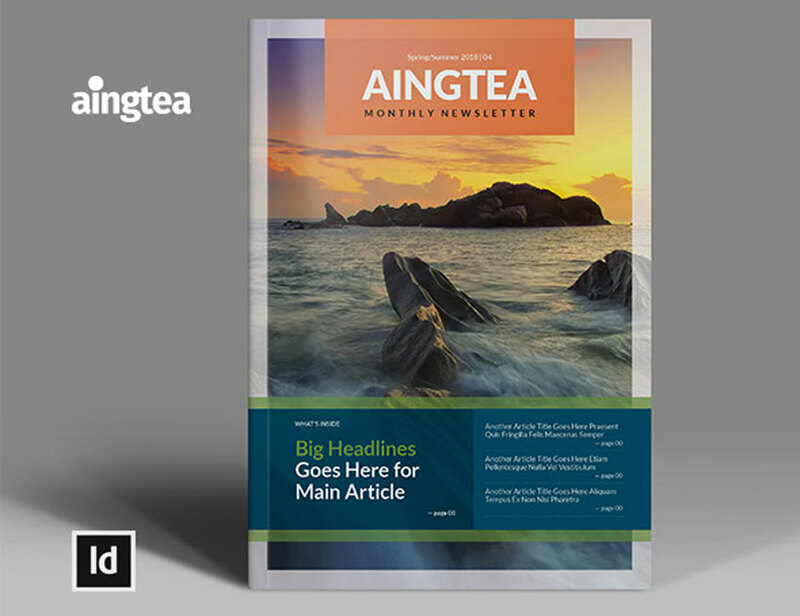 The Aingtea newsletter template is both striking and efficient. It features a smart, clean design with plenty of room for large photos and text. Enjoy the well-layered documents with editable features like smart objects and more to cover your needs. What are all the fun and exciting things happening on campus? Make sure to share them with your peers with this exciting newsletter. This multipurpose template is well designed with column layouts and more. Enjoy 12 unique pages for your student newsletter. 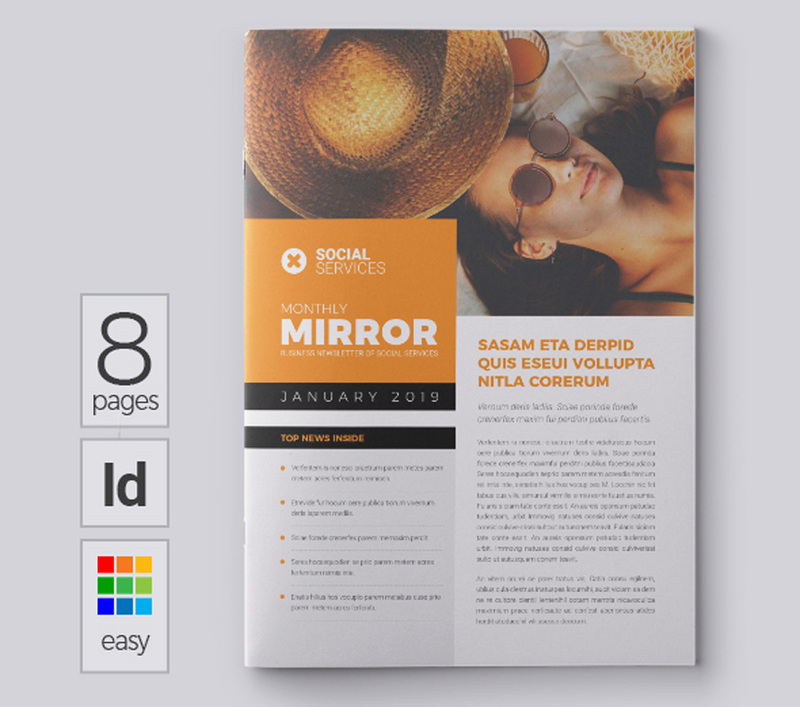 Multipurpose InDesign newsletter templates are perfect for students to design. This next newsletter template allows you to curate your favorite visual stories into one incredible cover. Check out this file to get access to eight custom pages along with a unique master set. Try it out! Looking for a simple, minimalist aesthetic? 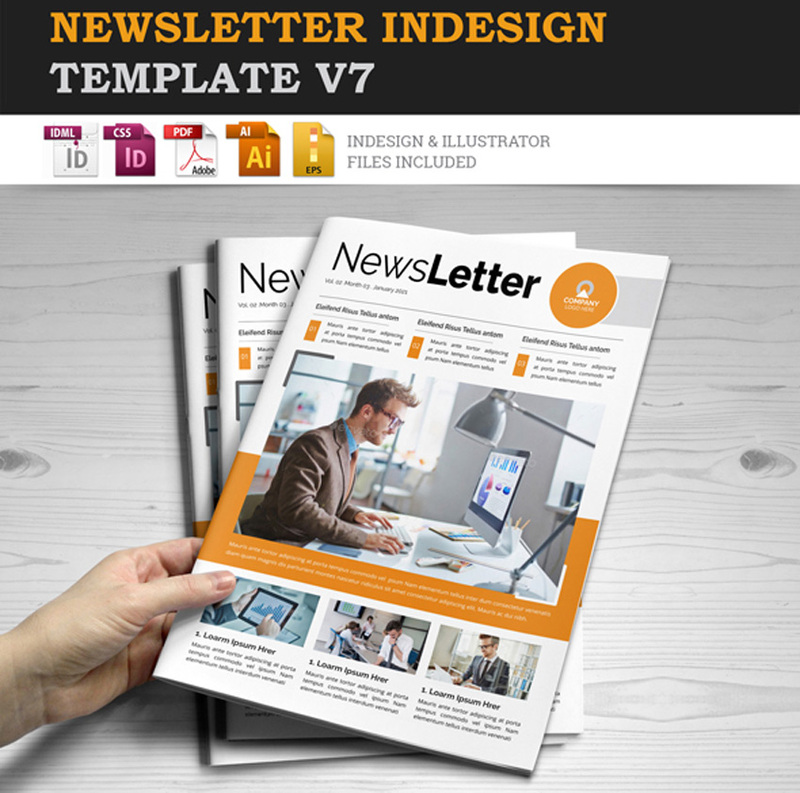 This next list of newsletter templates features effortless designs with very little upkeep. Though some Adobe InDesign experience is needed, you definitely won’t need to be an expert! 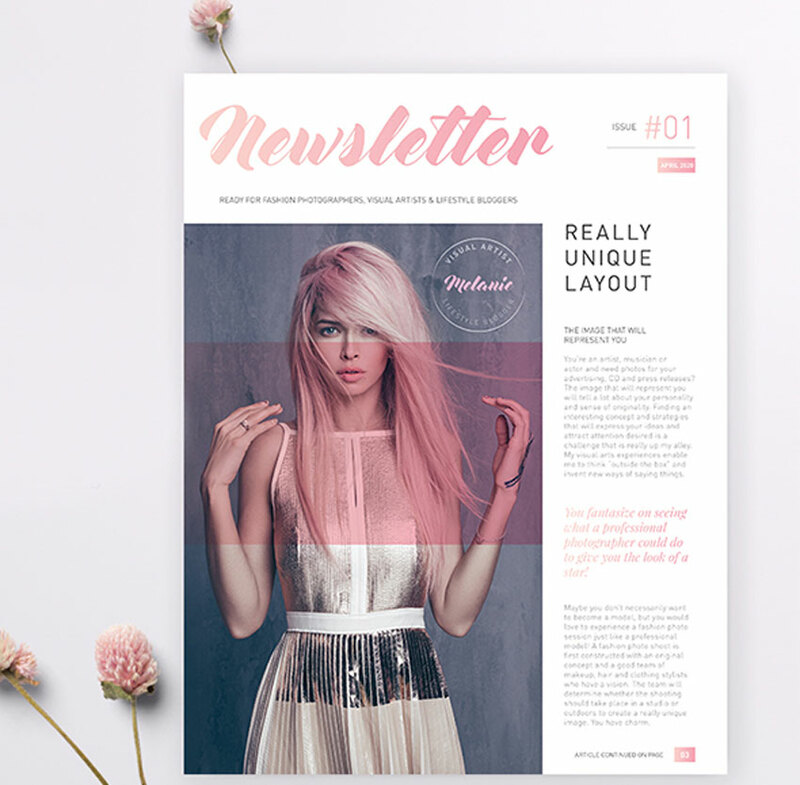 Keep things simple with this chic and sophisticated newsletter template. This elegant design features soft, calming colors and a balance of geometric and text elements. And since everything is fully editable, you’ll be able to customize this template as soon as you download it. Or shake things up with this next newsletter design. 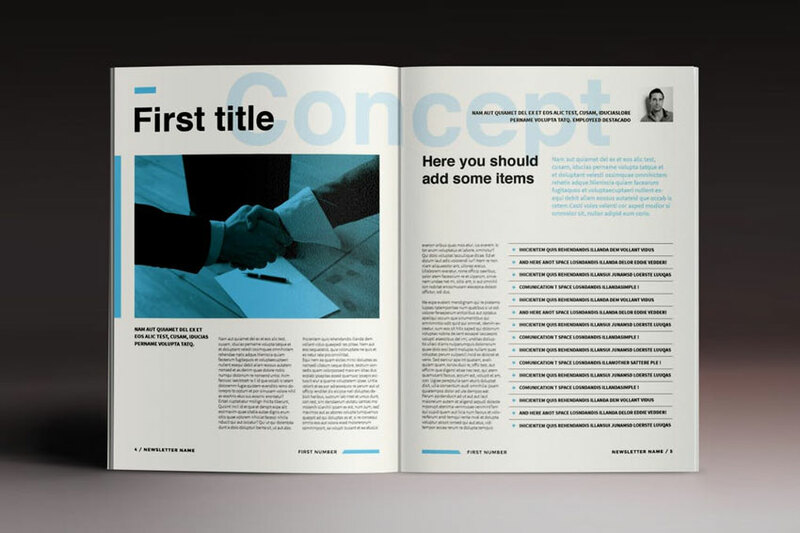 This template features a sleek, minimalist vibe that dedicates the cover to all your important headlines. Designed with a grid-based layout, this template contains 12 unique pages and so much more. Keeping your fans, friends or followers updated has gotten a whole lot easier. 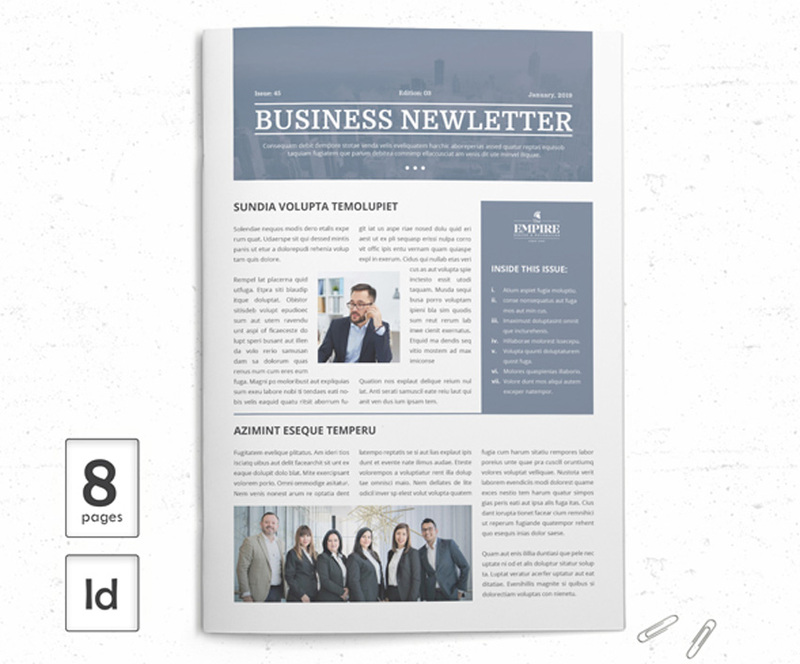 This newsletter template features a simple style that is easy to customize fast. Some of the features included in this design are four custom pages, automatic numbering, and editable graphics. 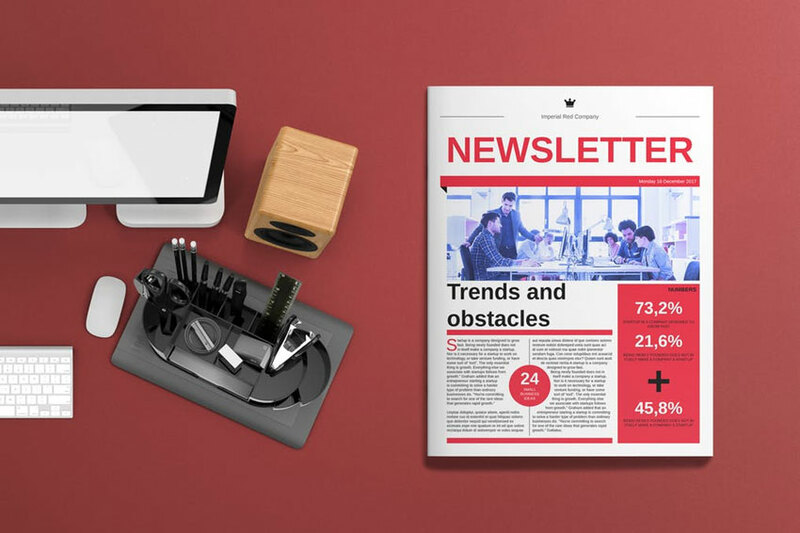 Create a refreshing, new experience with your newsletter. This next design is modern and professional. It includes plenty of room for your big headlines along with extra fun details to keep your readers interested. Have fun updating this template with Adobe InDesign. Running a fashion newsletter? Update your fans monthly with a stunning new template. Inspired by the latest trends in newspaper design, this template is fully organized with editable layers, graphics and text. Add it to your collection today! Do you have a great idea for a big headline? Write it down on this next newsletter template. This multipurpose design is modern and unique. It features large, angular photos that are sliced with bold color effects and text. Celebrate your great news with this fun template. 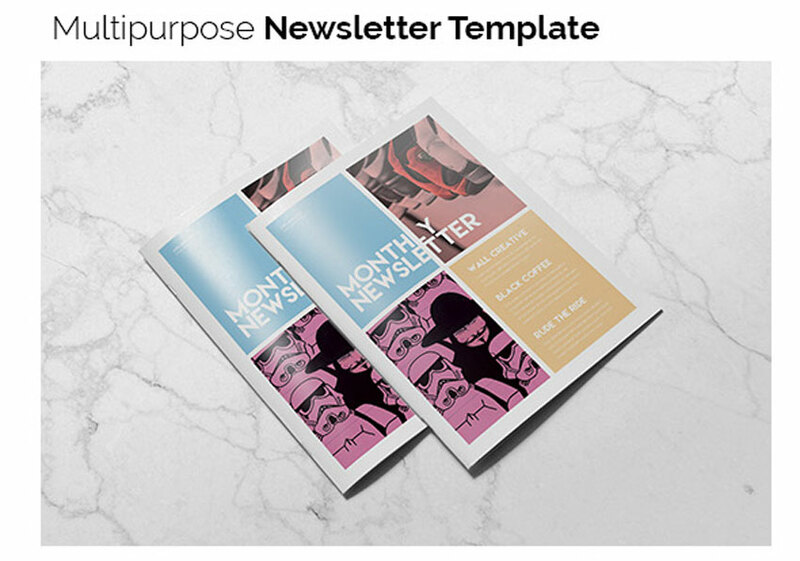 Celebrate your favorite moments in history or pop culture with this simple newsletter template. Although the images in the preview aren’t included, you’ll be able to update these areas fast with your own exclusive work. Enjoy fully editable files and a quick help guide. Minimalism never fails when it comes to great design. And this next newsletter template shows us why. It features a stunning, clean aesthetic with plenty of room for important visuals. Highlight your brand just like the one below with a striking, two-toned color effect. Feature important news about your industry. 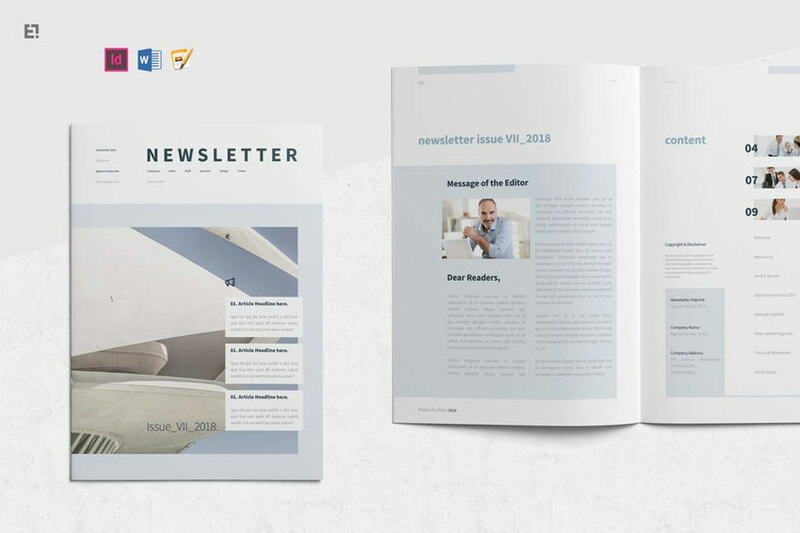 This stunning newsletter template includes eight pages packed into one easy-to-edit file. Update the text, graphics and photos with the latest versions of Adobe InDesign. Add it to your creative arsenal! 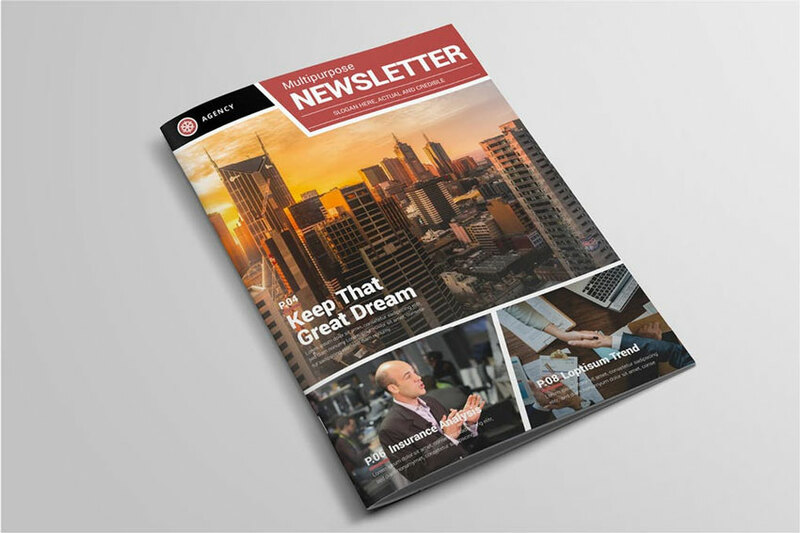 Keep your dreams alive with an exciting newsletter. This template is the perfect layout for bloggers, photographers, and more. Inspired by various creative industries, this template includes 10 pages available at a standard A4 size. Check it out! Launch a monthly newsletter with beautiful visual imagery. 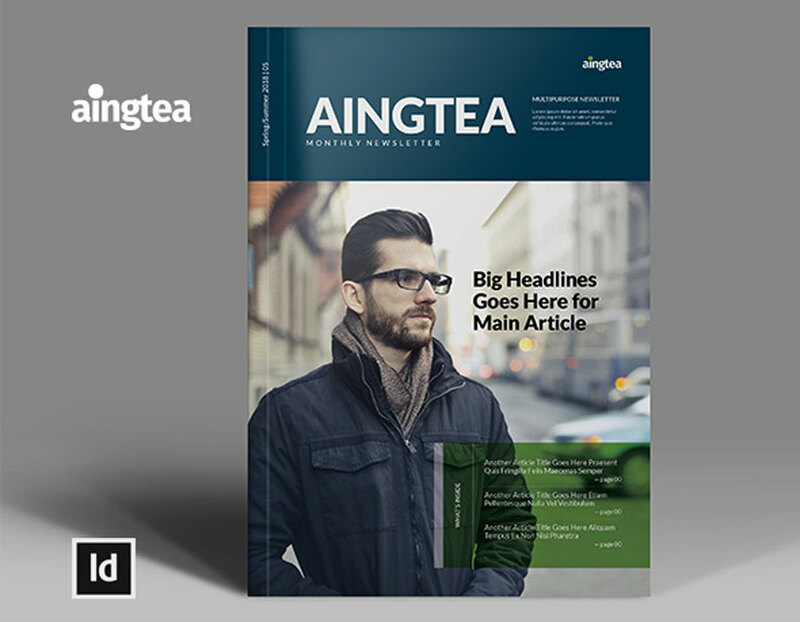 This next Aingtea template is best suited for striking graphics and photos. Keep your readers updated with 12 custom pages along with easily editable colors, text, and more. Add it to your collection! Share your discoveries with the world. 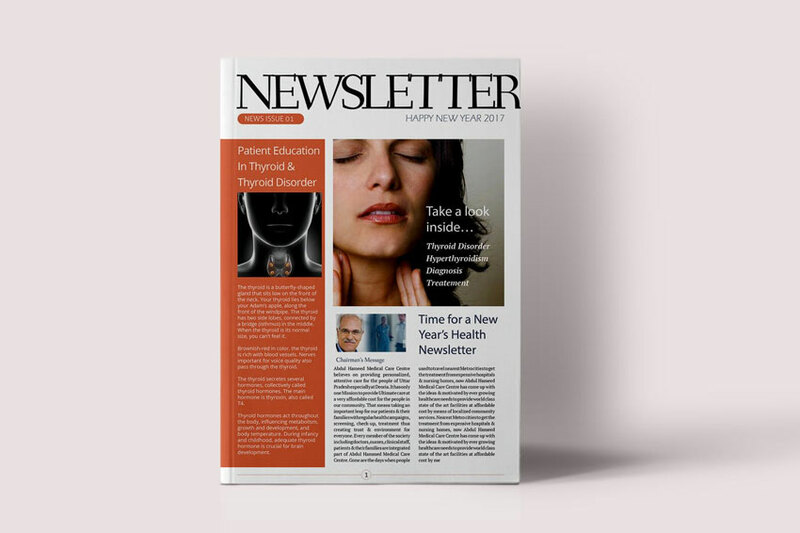 This medical newsletter is a great starter design for students and businesses. It includes print-ready files that can be printed as soon as you need them. Update them fast with the latest versions of Adobe InDesign. 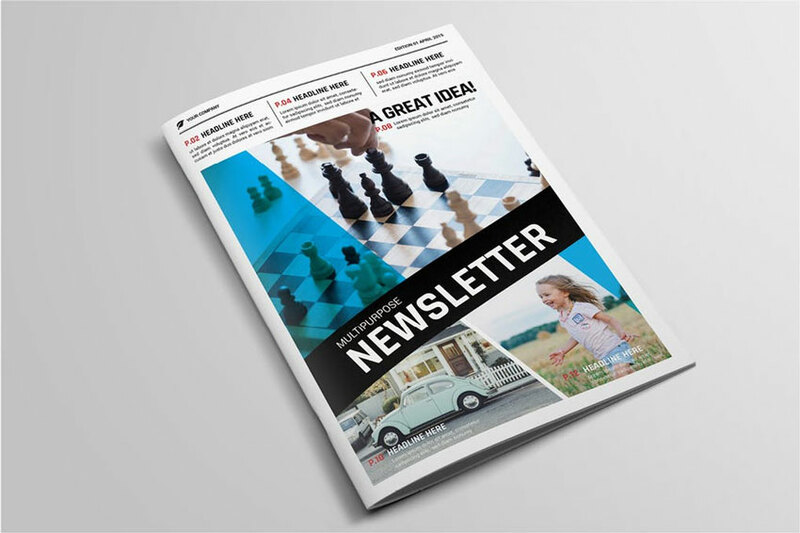 Want more options for your newsletter? Then check out this next fantastic design. 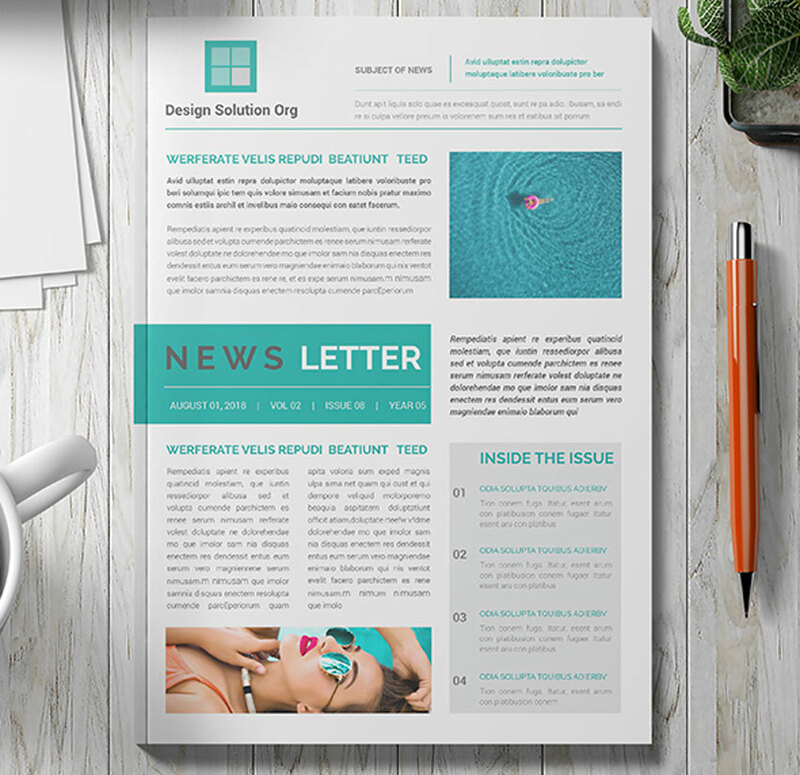 This newsletter template features three color variations that are all available in a standard A4 size. It also includes additional formats like editable Illustrator files for more help. Thinking of launching a corporate e-newsletter? Download this customizable template to get started right away. It was made with Adobe InDesign and features and additional PDF for more helpful information. Add it to your creative tools today! Inspired by the Sunday newspaper? Get the look you’re going for with this incredible template. Business-friendly and efficient, this template features a clean, minimal layout with well-organized layers. Get access to master pages, color swatches and more, all in one download!